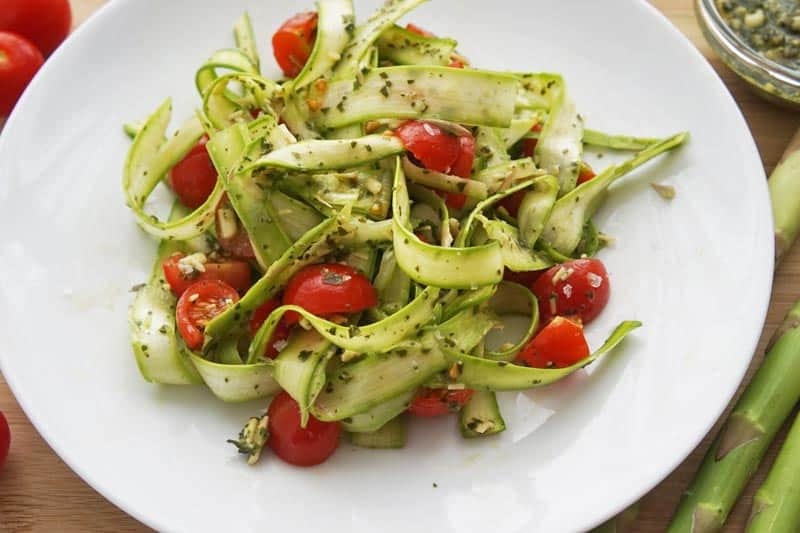 You will surely wow your guests with this beautiful pesto asparagus ribbon salad, perfect for any spring meal. When asparagus season comes around, I’m truly ready for some vibrant, spring dishes. But I quickly tire of the same old asparagus recipes, no matter how much I enjoy steamed and grilled asparagus. This shaved asparagus recipe allows you to enjoy asparagus in a completely different way. It’s served raw because the shavings are thin enough to make it not only edible but crunchy and refreshing. I learned to shave asparagus like this from a friend who was hosting an asparagus party one spring, many years ago. She had come up with dozens of different ways to serve this spring favorite. The shiny, delicate ribbons of asparagus she tossed with a light vinaigrette were so pretty and unique that I couldn’t wait to try making them myself. Turns out they’re incredibly easy to make and you can toss them with just about any kind of dressing you’re craving. All you need to make asparagus ribbons are some thick stocks of asparagus and either a potato peeler or a mandoline. Don’t bother with the skinny stocks of asparagus. They aren’t thick enough to make a pretty ribbon out of, and it will take forever to compile a small salad worth. The thicker stocks work perfectly, especially with a mandoline. Make sure you cut the tops and bottoms off before shaving them. The tough bottom of the stock doesn’t make for good crunchiness. It’s just tough and stringy. The tops can be saved and used for something else. I think they work particularly well in a spring frittata or omelette. My favorite way to serve shaved asparagus is mixed with a bit of pesto and sliced cherry tomatoes. You can even add some goat cheese crumbles for a little extra punch. You can make your own pesto, or just buy some at the store. Lightly toss the ribbons in the pesto, add it to the plate and top with tomatoes and cheese. I also like to add a spritz of lemon on the top for a little extra acid. It’s as easy as that. If you’re serving this dish at a party, be aware that the ribbons begin to wilt a bit about 10 minutes after they’ve been mixed with the dressing. So plan to serve it right away, or alternatively dress it at the table. The heavenly smell of fresh pesto and the wispy strands of asparagus are a perfect addition to an Easter meal or as a starter for a dinner party. Your guests will be wowed. Not many people have ever tried shaved asparagus. Like this recipe? We’d love for you to share it on Pinterest. 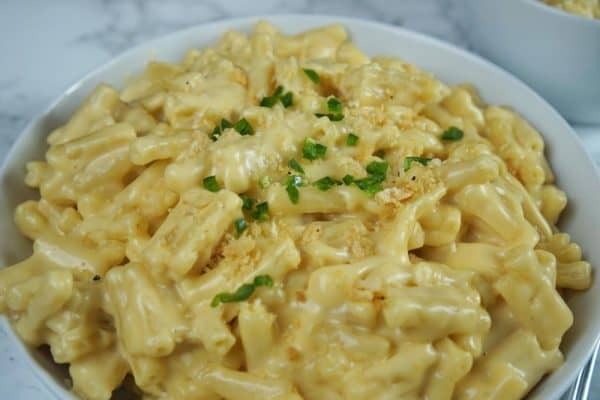 Made this recipe yourself? Please rate your experience and leave us a comment. Cut the tops and bottoms off the asparagus stocks. Using a mandoline or potato peeler, cut the asparagus into ribbons lengthwise. Place the ribbons in a large bowl. Gently stir in the basil pesto to coat the ribbons without breaking them. Add the tomatoes and feta cheese and toss to incorporate them. Spritz the lemon evenly over the salad. Add salt to taste. Serve immediately to avoid wilting.